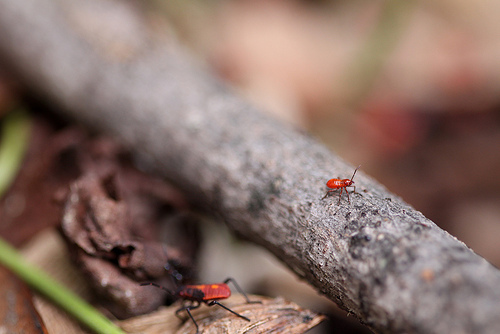 Jessica Lucia photographed these tiny Boisea trivittata nymphs at the base of a boxelder tree, where they were born and will continue to thrive on the fallen seeds. If they make it to adulthood they will start the cycle again, laying eggs of their own beneath the very same tree at which they were born. Or, they may fly off in search of new boxelder trees to feed and breed upon. Please click the link below to see more of Jessica's photography. Or, click here to see more of Jessica's Boisea trivittata images.